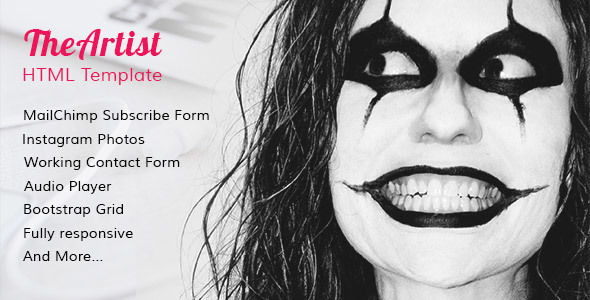 TheArtist HTML Music Template Created by future-themes. This templates have specific characteristics, namely: TheArtist has features such as High Resolution: Yes, Compatible Browsers: IE9, IE10, IE11, Firefox, Safari, Opera, Chrome, Edge, Compatible With: Bootstrap 3.x, Columns: 4+ . You can use this TheArtist HTML Music Template on Site templates category for album, artist, audio player, band, bootstrap, carousel, event, music, responsive, singer, vocal and another uses. TheArtist is a modern HTML music template that focuses on the music industry.It can be used for the websites of deejays, music bands, radio websites, and vocal performers.It looks great on all devices, both mobile and desktop.